The first artist of note from the second wave of New Orleans rock acts, Larry Darnell wasn’t from New Orleans at all even though he made it his musical home for the majority of his career and came to embody the city over the course of twenty years on the scene. 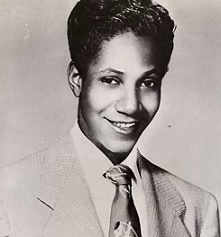 Born and raised in Ohio as Leo Donald the aspiring singer dropped out of school and joined The Brownskin Models Revue as a dancer in his mid-teens, a common outlet in the 1940’s for young homosexuals seeking to find a degree of social acceptance. He left the tour while they were stopped in New Orleans and took up residency at the famed Dew Drop Inn singing and playing piano where he quickly became a headliner. A balladeer at heart, Darnell could draw emotion from a stone thanks to a voice that ranged from a tender quaver in his its highest realm to exhibiting surprising power when he dropped lower all of which was delivered with perfect diction and an enviable ability to hold notes for an eternity without losing resonance. When he adapted a routine that injected a melodramatic spoken interlude into a heartfelt standard he brought the house down every night, becoming the hottest draw in the Crescent City and attracting interest from record companies across the country. Signed to Regal Records in late summer 1949 with Paul Gayten producing his sessions and playing behind him, as well as writing for him, Darnell scored two huge hits before the end of the year including a #1 smash. His chart success continued in 1950 but soon tapered off and he followed Gayten to OKeh Records in 1951 when Regal closed up shop that year. Widely billed as Mr. Heart And Soul for his way with dramatic material he remained reliably popular on a smaller scale, even appearing in a 1955 low budget rock ‘n’ roll film, but never again threatened to be a star. The mid-to-late 1950’s found him briefly stopping over at a number of impressive labels who hoped he could strike gold again but those records drew little interest as his original fan base were no longer sizable enough to matter and the younger generation were unaware of his past glories. By the 1960’s he had few releases to his name and was reliant on club appearances to keep . One final record at the end of the decade in a drastically updated style found no audience though it was widely praised by those who heard it and showed he might’ve been capable of remaining a viable current artist with a strong label pushing him consistently. Instead he retired from music just past forty years of age and disappeared from public view until he made headlines in 1979 when he was mugged and beaten so badly he nearly died. During surgery to repair the damage doctors found advanced lung cancer and while he hung on for a few years, having one of his lungs removed along the way, he died in 1984 back where he began in Ohio at his mother’s home, just 54 years old. Darnell’s vocal talents were undeniable and he enjoyed one of the most meteoric rises in rock’s early years. Yet despite a long run of solid records after that for some reason he could never live up to those early expectations and remains known today almost exclusively for the first few sides he released in at the midway point of the Twentieth Century.